The weak-signal detection approaches based on stochastic resonance (SR) are beneficial in detecting weak vibration signals from strong background noise. Therefore, many SR-based methods for mechanical incipient fault diagnosis appear. Among various nonlinear SR models, the underdamped tri-stable SR system, which has better output performance than other ones, has shown its potential superiority in weak-signal detection. 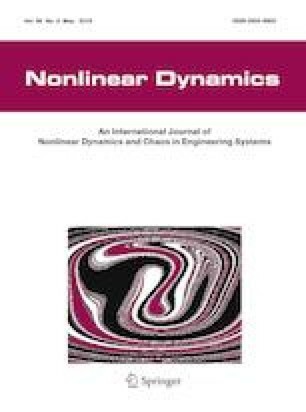 The shortcomings for this model include its nonstandard forms of nonlinear potential functions and its inadequate research on parameter-adjusting mechanism for parameter-fixed noisy signals. In order to solve these issues, a standard tri-stable SR system is introduced in this paper and its SR performance is studied. Furthermore, a multi-parameter-adjusting SR (MPASR) model for the standard tri-stable system is proposed and its parameter adjustment rules for different input signals to produce SR are fully studied. At last, we propose a weak-signal detection method based on MPASR of the standard tri-stable system and employ two practical examples to demonstrate its feasibility in incipient fault diagnosis. This work was supported by Natural Science Foundation of Jiangxi Province (CN) (Grant No. 20161BAB216111), Postdoctoral Innovative Talents Support Program of China (No. BX20180250), Science and Technology Research Project of Education Department of Jiangxi Province (Grant No. GJJ150068) and Key Laboratory of Lightweight and High Strength Structural Materials of Jiangxi Province (Grant No. 20171BCD40003).